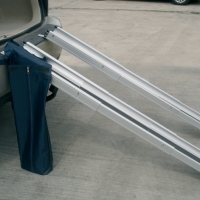 Lightweight Telescopic Wheelchair Ramps Non Slip. Made from anodized aluminium, these telescopic wheelchair ramps can carry up to 28 stone (180kg) per set. They have a non-slip surface on the ramp and also on the contact surfaces at the top and bottom,to prevent sliding whilst in use. Easily set up in seconds.